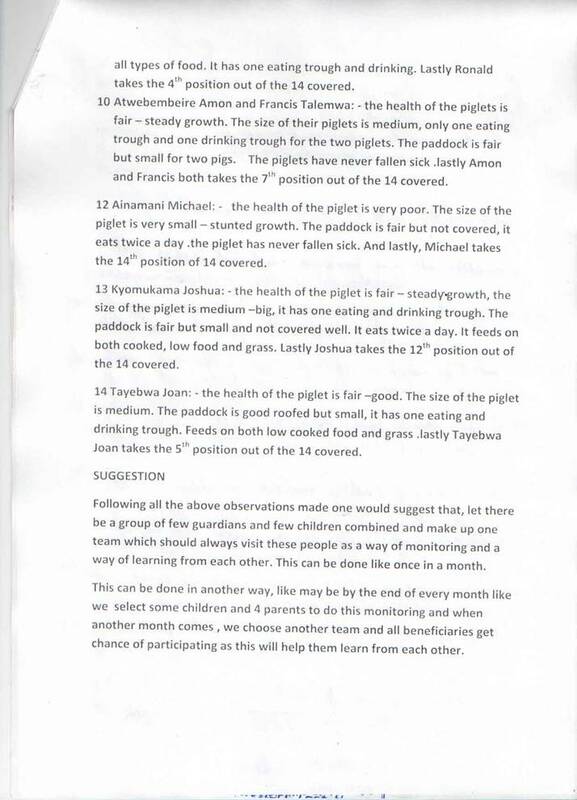 PROJECT PROPOSAL FOR PIGGERY PROJECT FOR THE ABANDONED CHILDREN / VULNERABLE CHILDREN. BY CHILD RESCUE VOLUNTARY ORGANISATION -KABALE - UGANDA. A piggery project is the project proposed. This is intended to be located in Kabale town which is found in south western Uganda. Kabale is a densely populated district. The biggest percentages of children are vulnerable due to:-orphanage, diseases like HIV/AIDS, poverty, extramarital relationships, heavy punishments etc. As a result children have failed to get basic essentials like food, shelter, clothes, medication and have ended up on the streets where they have been exposed to a number of risks that include:-unwanted pregnancies that has forced many young girls who become pregnant to throw away babies who are being picked by street children while in garbage centres. This idea has come at this time after two children were thrown into the bush and were picked by the concerned people who was handed over to this organization by police for assistance. Many children have died under such circumstances which have become a concern to establish a home where such innocent children can access assistance as away of crabbing down the increasing number of street children from psychological, physical and emotional suffering or torturing. In order for this project to succeed it will need both direct and indirect implementers including their input. The total cost will be € 13.765. This project will support the already established poultry project which has already started to address some children’s challenges. Children’s Rescue Voluntary Organization (CRVO) is a registered NGO found in Kabale town. The organization aims at restoring hopes of children from weeks to 17 years. It targets those who have lost hope due to physical, social, economical and emotional tortures. Kabale is a densely populated place and children constitute the highest percentage. Most of the people are below poverty line which has forced many to run away from homes to streets as away of reducing the increased number on the street where they are exposed to child labor, child trafficking, harsh conditions. The organization intends to establish a piggery with vocational centre to enable them access skills and security so a rehabilitation home is [proposed because once it is in place it will help in meeting challenges of vulnerable children. It will play pivotal roles in the social economic development of these children and it will provide an answer to those children who have been psychologically tortured. To address issues related to lack of basic essentials. To provide parental care to children. To restore the lost hope of vulnerable children. To enable all vulnerable children under this organization meet basic essentials for a bright future. Once this project has taken off, in the first 4 months the 10 she pigs will start to produce and each produces between 4-8 piglets which will mean that selling of piglets will start after five months where each will be sold at 4000/= (forty thousand shillings). Therefore the project will be selling piglets at the same time the old boars will be ready to be slaughted where each will be sold at the range of four hundred thousand to six hundred thousand depending on the kilograms. This project will be able to sustain itself in after six months and able to support vulnerable children in meeting basic essentials as well as supporting young abandoned children at the centre. We hope that since this project has limited risks of diseases we hope it will boast the poultry project hence addressing all the challenges concerning vulnerable children. The community together with leaders has been supportive in rescuing the abandoned children to the organization. The ministry of labor and social affairs, district probation office, Uganda police department of children and family protection unit has jointly supported the idea. As a result of a successful implementation of the project, the following are the expected outcomes. Children who are dying will be minimized. Children’s standards of living will be improved. Children’s state of living will improve. The affected children will have a home and be able to access education. Children who sleep outside will be safe since they will have where to be since that agency will be able to meet expenses. The lost hope will be restored. STRATEGIES FOR PROJECT IMPLEMENTATIONS AND OPERATIONS. In order for the project to be successful, there shall be an organizational chart which will be fully followed in its implementation and operations. Each actor will have well designed duties. At this stage the institutional frame work for the project will be disbursement of the largest portion of the project funds. BUDGET ESTIMATES FOR THE PIGGERY PROJECT AS AN INCOME GENERATING PROJECT IN SUPPORT OF VULNERABLE CHILDREN 2011. The Total cost will be 37.655.000 Ugandese Shilling. The project will fully be monitored by a team of professionals who will keep monitoring the progress of the project by observing the activities at all stages and identifying successes, failures, challenges, and indicators of performance, by proper monitoring of inputs, outputs, and the project impact, and by producing appraisal reports and financial reports. Close supervision, implementation and control of operations for the smooth running of the project hence in a bid to protect the environment, the organization will work hand in hand with National Environmental Management Authority to plant trees in some areas around the children’s home. Children Rescue Voluntary Organization will ensure sustainability and continuity of the project gearing to fighting child abuse hence improving on the standards of living of the vulnerable children who have been abandoned hence restoring their lost hope through the parental care. 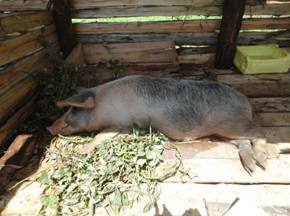 A REPORT ON PIGGERY PROJECT EXPENDITURE. 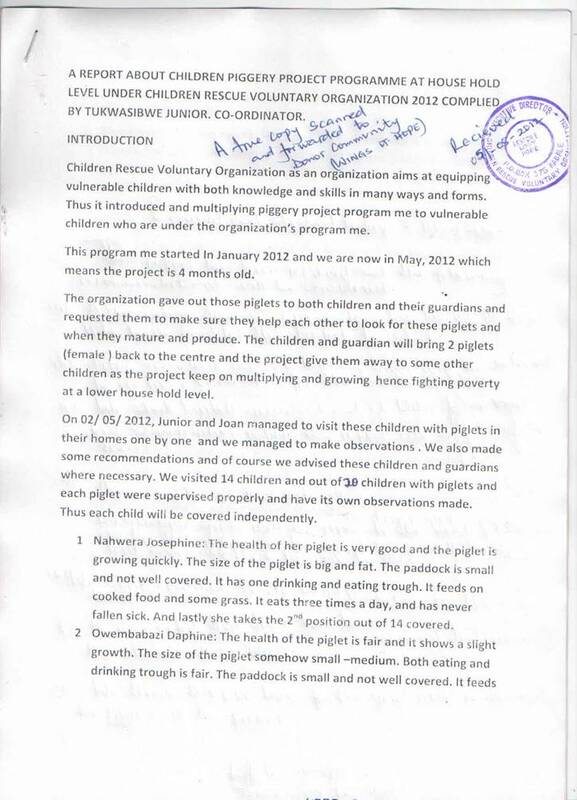 Children Voluntary Organization a Non Governmental Organization which aims at Restoring Lost Hope for Children through a number of remedial activities as an approach of rehabilitation process, hereby submit a report on the progress of piggery project which was supported by Vleugels Van Hoop VZW. On 7th March 2011 a co-operation agreement between the donor association and Children Rescue Voluntary Organization was signed. In April 15th 2011, we received the first part of the funds worth 8000 Euros which enabled us to start on the implementation. On 16th April land was bought at a cost of nine million Ugandan shillings (9,000,000/=). On 27th May 2011, the structure was ready to accommodate pigs four pigs were bought. As per today 1st June 2011 we bought only 50 bags of marsh which increased from 45000= to 58000= (fifty eight thousand per sack) which has become 2,900,000= shillings. The total expenditure so far as per today it is standing at: 18,275,000/=. According to the budget we are working on, we need 350 bags of marsh whose price went up, 7 more pigs, monthly water bills and vaccines to make this project a success. Despite all the above successes, we have been able to meet some challenges due to the increase of prices of some commodities. However, we are thankful for the tireless efforts the associations members have put in place to make this project start well. Once the project has been fully stocked it is going to be a most income generating project to support vulnerable children. We humbly salute all members who have played a tremendous role in both sides for the biggest percentage so far realized. 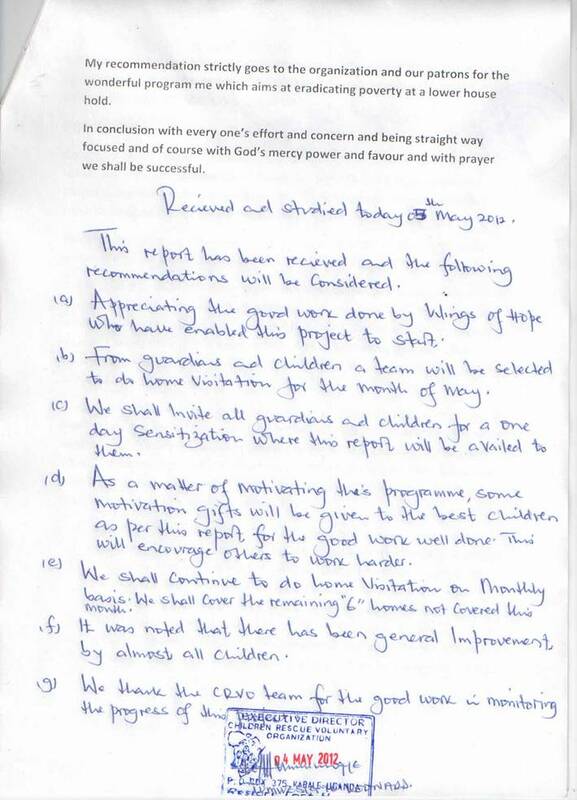 We pledge our total commitment to co-operation in ensuring that there is proper implementation and accountability. We continue to welcome your brilliant pieces of advice as you have always done. For Children Rescue Voluntary Organization. The piggery project is an income generating project that started this year in April with the help of Vleugels van Hoop association. This project aims to improve the live conditions of vulnerable children. The project started with one boar and three female pigs. By the end of July, we bought seven more female pigs which am happy to report that they are adult. By the end of august the first female pig gave birth to five piglets which are in good health and this gave more hope of expansion and it brought joy to all vulnerable children. The pigs are all in good conditions and most of them will soon (next month) be producing according to our veterinary officer. We have been able to grow some vegetables for the children in the farm since we get manure from the animals. This has enabled children’s participation and has enabled them build agricultural skills. As from now, we have cabbages and tomatoes in the pig farm which enable us to have food for the children. 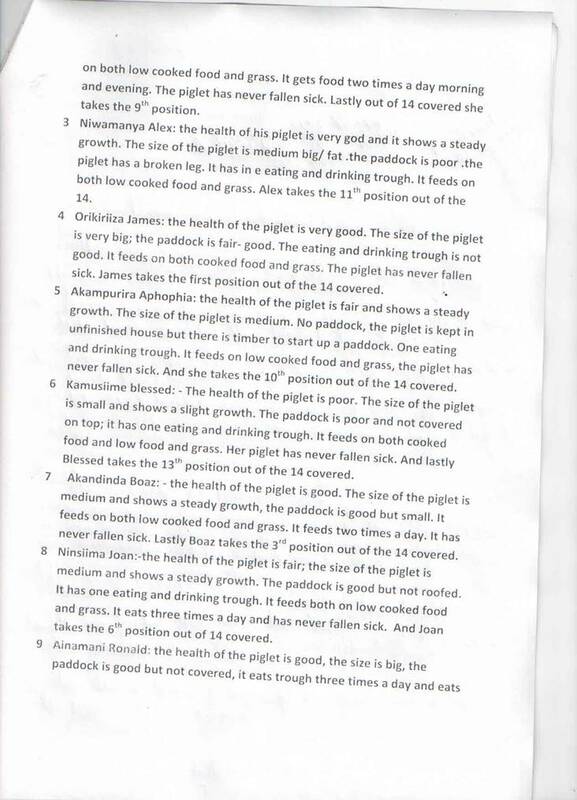 The children have continued to participate in the piggery project, especially during feeding times. They have been able to learn on how to care for the pigs. We feel that once they acquire such practical knowledge and skills, they will be able to support others in future. Despite the above tremendous progress, we have been able to meet some challenges which has continued to affect the development. An increase of prices due to inflation. The marsh, which used to be at 48000 Uganda shillings, costs today at 96000 shillings for a sack of only 70 kg, which has affected us in terms of food. Increase of transport costs. Since the fuel price went up, we have continued to face this challenge because we need to transport food to the piggery farm. Therefore hiring has become a big challenge. Future plans: We feel that since we have little babies who are approaching nursery school, a nursery school should be started in the names of Restore hope nursery and primary school. 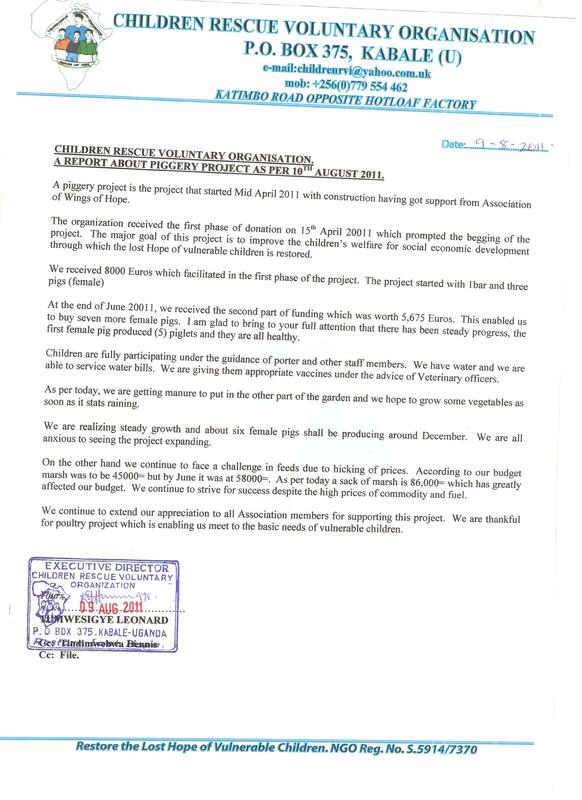 For the rest we feel very humble for the great work the members of ‘Vleugels van Hoop’ have continued, in restoring the lost hope of vulnerable children down here in Kabale in Uganda. Your continuous support means a lot in the lives of the vulnerable children. Thank you for your loving advice and support. NB. We continue to welcome your parental ideas and advice as you have always gave to us. Visit of the ‘piggeryproject’ and the song ‘Don’t forget us’! 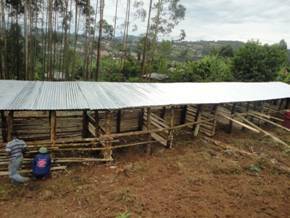 Sunday 08.01.2012, we visit the project ‘piggery’ at Kabale. We meet the responsible of the project, Leonard, in the room of CRVO (childrens rescue volontary organization). What we do not yet know is that it will be a day of great emotion. After a bus ride of half an hour along on meanwhile well-known bumpy roads , we are welcomed by a whole group of children who accompany us up to the location of the farming and the vegetable garden. The place is festively decorated and we are entertained with dance and songs from the children… entertainment for everyone! Above all, the song ‘Don 't forget us ’ we’ll always remember! Leonard’s speeches are translated into the local language so that the children and the women of the host families can follow everything. All together we enjoy a hot meal, along with meat, which for many children is of long ago since Christmas day! Towering stuffed dishes disappear in the stomachs, with in addition a ‘ Fanta ’, a luxury product for all those children. Not a drop is lost!! A great surprise is on arrival: Leonard did indeed reserve this day to hand over 22 piglets to the children who reside in the host families. There is applauded every time a new name is called in. The children bind a colored ribbon to the paw of their own pig to identify it, because they will be responsible for the care of their animals. The project provides that a piglet of the first throw goes back to the Centre in order to pass on to another family. So, the circle of ‘development ’ of the project is growing. We know that they remained spared of a disease under the pigs which various farmers affected. Thanks to good maintenance and hygiene, they have probably escaped. The stables and the surrounding area are very clean. No smell has bothered us and who has pigs farms knows what we speak about. One of the sows had apparently meaning to join us and came looking over the fence, to great fun of everyone. Our afternoon was completed with a song together with the children and Anne, who plays flute. She gave the children a surprise concert which was very much appreciated by the children. How everything can be so nice, thanks to this project which you support!!! Thanks to all who make this possible!! You are superb, not (only) we!